"The only thing more terrifying than the Western Front… is what lies beneath it." 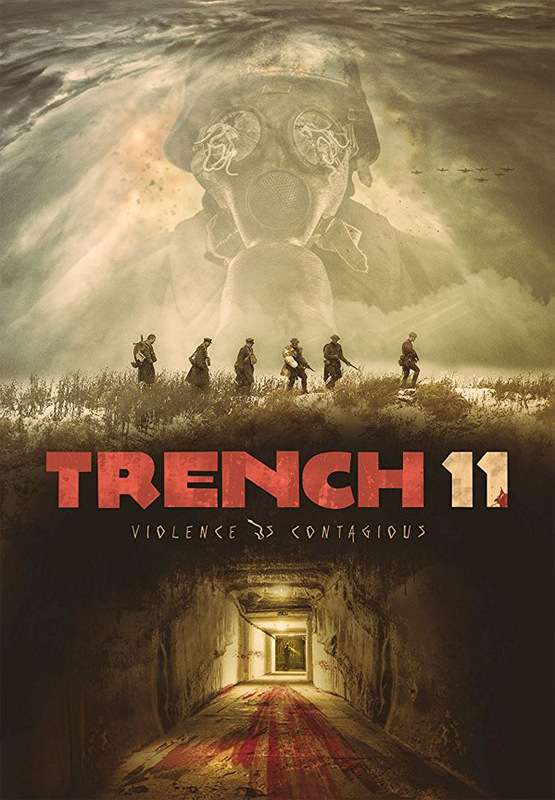 A trailer has debuted online for a WWI zombie horror thriller film titled Trench 11. This indie horror has been playing at various genre film festivals the last few months, including Fantasy Filmfest in Germany and Toronto After Dark, but still doesn't have any US distribution set yet. Trench 11 is about a special biological weapon the Germans developed that turns its victims into deranged killers. The plot follows a group of Allied soldiers stuck deep under ground trying to figure out and stop the spread of this dangerous, deadly disease/weapon. The film stars Rossif Sutherland, Karine Vanasse, Shaun Benson, Charlie Carrick, Ted Atherton, Adam Hurtig, Robert Stadlober, and Luke Humphrey. This looks dark, and gnarly, and very violent. Dig in. In the final days of WWI a shell-shocked tunneller leads an Allied team into a hidden German base… 100 hundred feet below the trenches. The Germans have lost control of a highly contagious biological weapon that turns its victims into deranged killers. The Allies find themselves trapped underground with hordes of the infected, a rapidly spreading disease and a team of German Stormtroopers dispatched to clean up the mess. Trench 11 is directed by English filmmaker Leo Scherman, of the films Never Forget and White Knuckles previously, as well as extensive TV work including many episodes of "Scare Tactics", "Fool's Gold", and "The Carbonaro Effect". The screenplay is written by Matt Booi and Leo Scherman. This first premiered at various genre festivals this year, including Toronto After Dark, Fantasy Filmfest, and Screamfest next. No official US release date has been set yet, stay tuned for more updates from here. Anyone interested in this?